About: Fefe Talavera was born in 1979 in São Paulo, half Mexican half Brazilian. Interested in all kinds of underground movements, she was profoundly influenced by the freedom of the graffiti scene of her hometown. Graduated in fine arts by the FAAP (São Paulo) while working in the streets, her raw creative energy end-up finding correspondence with the angled tribal‐like style. Fefe is mainly interested in finding public ways to express herself, even though she also shows at galleries accepting certain rules, limits and the typical intolerance of the art market system. As other artists from her generation she perceives São Paulo as a contemporary megalopolis shattered by social, economical and ecological problems which had a harmful impact on the urban landscape. The public walls thereby remain one possibility of showing what is beautiful “inside” the strong personalities of the people living there. Fefe, who was also influenced by Mayan or Aztec mythologies and her Mexican heritage, is well known for her monsters made of cut out letters from concert-advertisement posters found in the streets. The collage of figures are related to the artist’s admiration for typography, books and prints, but also to her will to somehow “free” the letters from their fixed meaning as words, sentences or texts. The artist reminds us that all kinds of languages are rooted in the direct expression of human affects. Even though the “letter‐monsters” became very popular because of their originality, painting and producing visual arts remain the artist’s means of a very personal, intimate and poetic language. Where you can see it: Fefe exhibited and participated in major projects all over the world: New York, Los Angeles, Moscow, Berlin, Vienna, Seville, Madrid and Amsterdam, to mention only a few. 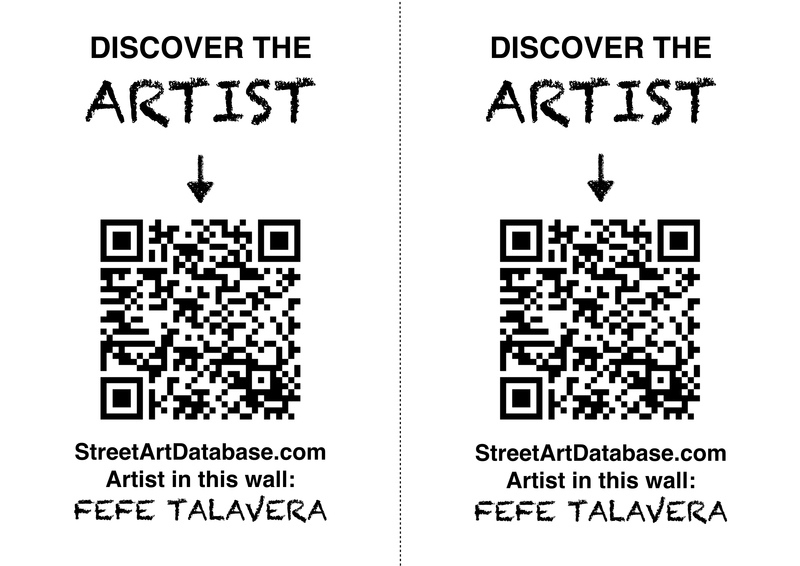 PRINT CODE: help tagging Fefe Talavera in the streets of your city!